Video of today’s event in Chatsworth by Mario Noriega. 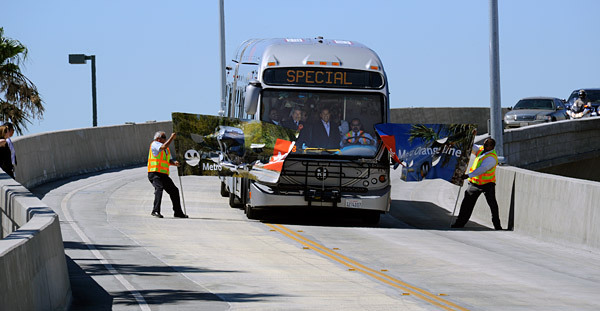 Metro Orange Line bus breaks through banner at dedication event held at the new Chatsworth Station. Yes, that’s Mayor Antonio Villaraigosa and Los Angeles County Supervisor Zev Yaroslavsky in the operator’s cab. Photo by Gary Leonard. The Los Angeles County Metropolitan Transportation Authority (Metro), joined by city, county and state officials, today celebrated the completion of the Metro Orange Line Extension, a four-mile addition to the wildly popular dedicated busway that will enhance regional transit connections to and from the Western San Fernando Valley. The first transit project identified in Measure R to begin construction in 2009 has been completed ahead of schedule by three and a half years, and its original $215.6 million budget is currently forecasted to come in at approximately $154 million, $61 million under budget. The final project savings will depend on the closeout of the project, including the resolution of any final change orders with the contractor. Prior to the passage of Measure R, this transit project was scheduled to open in 2016. The brand new north/south busway extension from Canoga Park to Chatsworth was built on a Metro-owned, former Union Pacific railroad right-of-way and adds four new stations, three new or reconfigured parking lots, a new busway bridge over active railroad tracks, two new busway bridges that cross waterways, new signalized busway/street crossings, street resurfacing improvements, new bicycle/pedestrian path, and landscaping similar to the original Metro Orange Line. Now at 18 miles, the busway and its adjacent pedestrian/bikeway are the longest of their kind in Los Angeles County. The official opening of the line will be Saturday, June 30. Community festivities will take place from 10 a.m. to 4 p.m. Saturday only at the Canoga and Chatsworth Stations and will include food trucks, live music, group bike rides and much more. Free rides on the extension are planned both Saturday and Sunday between 7 a.m. and 7 p.m. Regular fares will apply on all other Metro Rail, Metro Rapid and Metro Local lines. Metro’s Congestion Management Plan reports that nearly 50 percent of San Fernando Valley home-to-work trips are made to destinations outside the Valley. The extension of the busway to the Chatsworth Metrolink/Amtrak Station, which also serves several Metro and municipal bus lines, is expected to offer these residents more public transit options for these trips. The Chatsworth Station is one of the busiest stations on Metrolink’s Ventura County Line. Amtrak’s San Diego to San Luis Obispo Pacific Surfliner also makes stops at Chatsworth. By the year 2030, the extension is expected to generate 9,000 new average weekday boardings. Metro projects the entire Metro Orange Line including the extension will generate 45,000 daily riders by 2030. When originally opened in October 2005, Orange Line ridership immediately exceeded Metro forecasts, with nearly triple the amount of daily boardings. Most recent ridership figures for May 2012 were 26,670 average weekday boardings. New platforms have been added at the Canoga Station for Metro customers heading north on the extension, and a new 207-space park and ride lot has also been built at the Sherman Way Station. There will be a total of 1,075 parking spaces available at all three park & ride lots on the extension, and more than 4,000 parking spaces throughout the line. The travel time for the busway is approximately 51 minutes from North Hollywood to the Chatsworth Station. Service will be split between North Hollywood/Warner Center and North Hollywood/Chatsworth. Peak weekday shuttle service will operate between Warner Center and Chatsworth approximately every 15 minutes. Several contributing factors led to the project being completed ahead of time and under budget: a low bid during a significant economic downtown, good project management and cost savings associated with early completion. The Metro Art program has installed art works at all Metro Orange Line stations. Tours of the stations along this line, as well as all Metro Rail stations, are available by arrangement for groups of 15 or more. For more information, visit metro.net/art. The Orange Line Extension is a Measure R project. Fortunately, Metro was able to secure other funding to help pay for busway construction. Measure R taxpayers will benefit from $182 million that was earmarked for this transit project which can be applied to another San Fernando Valley transportation improvement in the future subject to Metro Board approval. For additional information, visit metro.net/projects/orangeline. Nice! Suggestion, make the signs that say “Busway” a bright Orange color and make them say “Orange Line Busway”. Believe it or not, it will make the busway much safer than it is. So the extension will add more people to an already overcrowded Orange Line. And will be worse if the other end of the Orange is extended say to Burbank Airport or Downtown Burbank. AND then, if the north/south SFV-405 is built and crosses this line, the buses will be completely unable to cope. Should have a subway for sure, could have had a very wide and long useable linear park/bike/ped paths the whole way connecting stations. Or if not subway, light rail. Speaking of which, has there ever been a busway converted to rail in North America ? First off, the person that wrote ….. “Busway” a bright Orange color and make them say “Orange Line Busway”….. Is right. I would definetly be safer, and it would “advertise” itself. Second off, the person who wrote …. the extension will add more people to an already overcrowded Orange Line….. I think that is the whole plan. You need to be happy that it is overcrowded, overcrowded means we need more. Also having the Orange Line as a subway, or light rail would be nice, but is it wise to waste money on something we already have that is already nice, or spend money on something else to be created nice, having to nice things is way better than having one beautiful thing. The Downtown Seattle Transit Tunnel was built as a “Busway” and is presently joint-use. After the Light Rail Line (“Link”) is opened to the University of Washington, the DSTT will become rail only. P.S. I was glad to see so many buses sporting “901” on their destination signboards, since that is what the “Orange Line” really is: A bus route.